Record from external sources, such as your A/V receiver, to the DA-9000's 20 GB (4000 song capacity) hard drive. Record from the DA-9000's hard drive to Music type CD-R/RW discs or to an external source, such as a MiniDisc player. Transfer audio tracks from your PC to the DA-9000, record from external audio sources, rip and play CD tracks and record to CD-R/RW Includes backlit 4-line text display and remote control. Using the included TDK PC Transfer Software, MP3 files can rapidly be copied from your PC onto the DA-9000's 20 GB (4000 song capacity) hard drive. Browse the hard drive by Album, Artist, Playlist, Last 20 and Top 20 tracks, and create your own playlists. 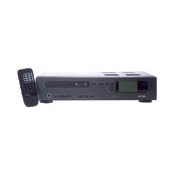 The DA-9000 is compatible with standard audio CDs and with MP3 data discs. Soundis awesome +++, Able to create playlists of 250 songs and then hit random to playback different order. You don't have to look for a CD because everthing is on the hard drive. A few cool features like being able to sort by album name or artist name(but see below). This Jukebox is great in that I am able to load approx. 2,000 songs on it, both from downloaded music stored on laptop and by ripping some of my favorite CD's. I connected to my Denon 3803 using digital optical cable and it sounds really great. I have the Def Tech 2006TL's in home theater set up and it sounds real good. I have burned CD's to play in the car and they sound fine, too I think I am picky when it comes to listening and the jukebox gives youthe ability to rip onto hard drive at 3 different speeds... 128/320 and full CD quality... I can hardly notice the difference, so I have most stuff in 128 and some of my more critical listening music in cd or 320.